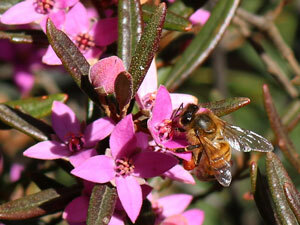 Bushwalking in the Blue Mountains in late winter, you will usually come across bright pink Sydney Boronias in flower. If it's a warm day you may also be greeted by the delightful boronia fragrance - which comes from oil glands on its leaves. I was walking along a fire trail on Kings Tableland when I spotted this small shrub with white flowers nestled up to a Scribbly Gum. "That's a Boronia!" I say to myself and quickly compared it to a standard pink form flowering nearby. Sure enough! 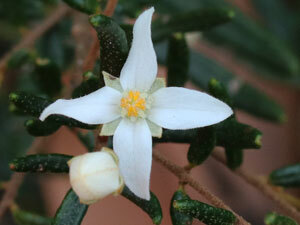 The Royal Botanic Garden subsequently advised me that although a Boronia ledifolia with white flowers is uncommon, they have some specimens of it. They also said that "they don’t call this a variant or form as flowers can be pale to bright pink or rarely white". Boronias are members of the Rutaceae Family which also includes citrus fruit. 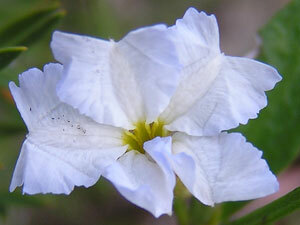 Most members of the Rutaceae family have 5 petals - Boronias and Zierias have 4. Boronias have 8 stamen - Zierias have 4.
its sepals - which jut out between its petals. Its flowers are 10-20mm across and vary in colour from white to very dark pink. Of course Mother Nature doesn't like to be constrained - here's a Sydney Boronia with 5 petals. There seems to be many species that throw out a white form of their flowers. A white Waratah (Telopea 'Wirrimbirra White') has been available from nurseries for many years. It was cultivated from a plant found near Robertson. Pink Flannel Flowers regularly produce a white form, and you may find one or two among the hundreds that appear in drifts of this very special plant. Pink Flannel Flowers only appear in the summer after the summer following a bushfire. 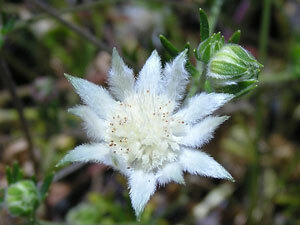 Here's an image of a "standard" Pink Flannel Flower - its flowers are about 20mm across. 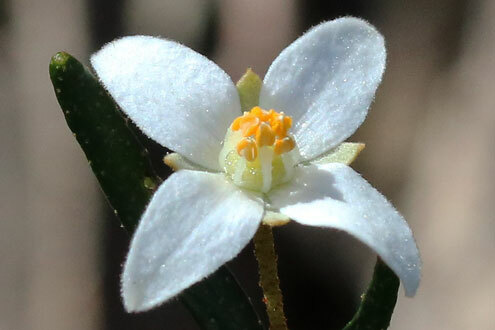 The white form of the Blue Dampiera, shown here, was a separate plant - as was the white Boronia above. I was just as stunned to find this as I was on finding the white Boronia. Here's an image of a "standard" Blue Dampiera - its flowers are about 20mm across.. I am yet to see another white one. The genus Dampiera was named after the English buccaneer William Dampier - who made the first detailed record of Australian flora and fauna. That was in 1699!